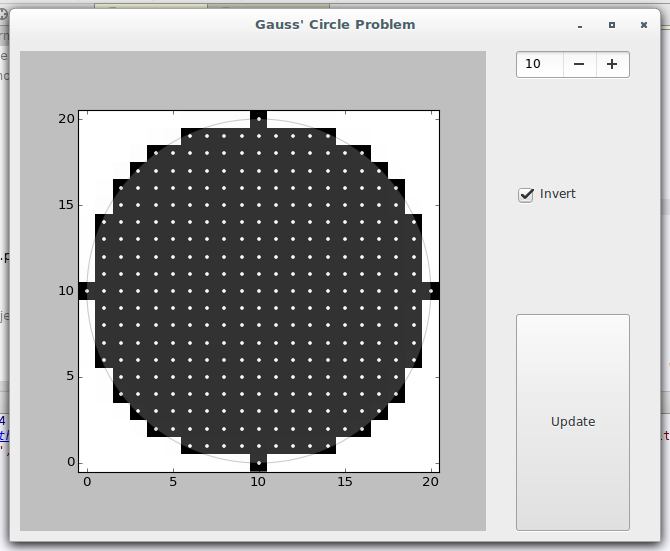 While I was looking through old scripts the other day I came across one that produces a visual verification of Gauss' Circle Problem with Matplotlib. I thought it'd be fun to wrap it in a simple GUI with buttons to re-plot with different radii! The result is the following class.
""" Main application--embed Matplotlib figure in window with UI """
""" Main window UI """
""" Re-calculate using the formula """
""" Set up the initial plot; only called once """
""" Update sigma and trigger a replot """
""" Switch the parity of the plot before update """
""" Draw or update the current plot """
And the following is what the window looks like. Again, it's not pretty, but so far it works! Improvements I'm hoping to make include grouping the buttons in the right bar together (vertically) and adding a very simple menu bar at the top that allows you to save the current plot; an info button in the sub-menu might be cool too. Although this is almost nothing like writing GUIs in Java (which require knowledge of many more OOP concepts), it definitely felt like I was writing a traditional Python class while I was working on this.